Stamford’s Conor Nicholson gets a double during a Senior American Legion Championship game against West Hartford in Middletown on July 28. At the end of the month, the best Senior American Legion teams in Connecticut will meet in the state tournament. Stamford, RCP, Cheshire, Trumbull, Avon and other top teams will be vying for the crown sporting rosters littered with Division I-caliber talent. It would be easy to look at the final eight teams left in the tournament and think Legion is thriving in the state. While Legion might still rule in those communities, some programs are beginning to find it hard to put quality teams on the field. In fact, from the 2017 to 2018 season, 10 Senior American Legion teams in Connecticut folded operations. 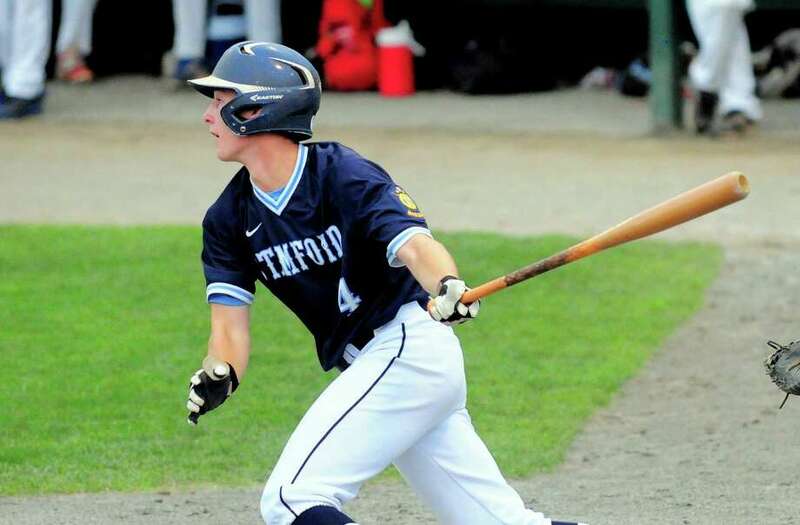 Unionville, Milford, Prospect, Darien/New Canaan, New Milford, New Haven, Monroe, Oxford, Ansonia and Plainville all shut down senior legion teams heading into this summer. Four of those teams were from Zone 5, which encompasses the greater Waterbury/Danbury area. A team from Washington formed, picking up players previously playing for New Milford. That is an alarming number of departures in one season and a growing trend nationwide. Georgia no longer has Legion baseball and the baseball hotbed of Texas only supports 12 programs. Connecticut currently has the sixth-largest program in the United States, fielding 132 teams spread out among the preps, juniors and seniors. There are 65 teams on the senior circuit. Put side-by-side to others, Connecticut is thriving, but still trending the wrong way following so many departures. Greenleaf said next season the state will shrink from eight to six zones, consolidating because Zone 5 is down to just seven teams, even with the addition of Washington. The challenge now is how to keep the elite teams at their level while not losing the teams from the bottom half of zones. The reasons behind teams folding are varied, but the vast number of travel and AAU teams drawing players away from local legion teams is certainly at the top of the list. According to multiple legion officials, other programs folded because the players and coaches did not see eye-to-eye. Therefore players stopped coming out for a team they felt was being run by a coach they did not want to spend their summers playing for. Still others are no longer playing Legion because the programs were not winning and players stopped coming out for teams annually bringing up the rear of the standings. These are issues that are not going away and need to be addressed by forward-thinking Legion programs. One of the complaints of players forsaking Legion to play for AAU and travel teams is the promise of getting more exposure in front of college coaches. Legion has combated that in recent years by creating The Rawlings College Showcase held July 5 every year, allowing the top players in Legion to play in front of a horde of college coaches. This year the event will be held at Central Connecticut State University. To their credit, the state legion board has made allowances for players to take part in more showcases and for teams to compete in tournaments outside of their zone and the state in an attempt to keep them at home and playing Legion. Among the teams taking advantage, Stamford will be playing games at West Point this summer, Orange is scheduled for an out-of-state tournament and Trumbull will play in a weekend tournament in Rhode Island. Trumbull Senior Legion coach Jack McFarland grew up playing Legion baseball in Fairfield and got into coaching because he feels it is the best league for 19U players. A typical Senior Legion season consists of 30 regular-season games within the zone, five to six games a week, plus the postseason tournament. AAU and Premier teams, such as the Connecticut Blue Jays, Tides and Bombers, play weekend tournaments and showcases up and down the East Coast as well as games during the week against other travel teams, sometimes playing as many as 50 games in a summer. The cost to play Legion is $600 to $1,000, depending on the program. Elite AAU and travel teams often cost a minimum of $3,000 for the summer, with some elite travel clubs charging more than twice that. While towns like Trumbull and Stamford are thriving in Legion, towns like Fairfield are struggling to keep their program afloat every summer. That may seem surprising for a town like Fairfield which has had nearly unparallelled success in Little League. However, the players simply scatter to so many different teams after the 12-year-old season. One change Ford would like to see is Legion allowing for expanded rosters, so if player could only commit to part of the summer, the demanding schedule does not scare them off. Other programs can replicate the success of Cheshire, Stamford and Greenwich at keeping the best kids home. They will have to if American Legion Baseball is going to survive in Connecticut.